Early in February, Make It Happen! 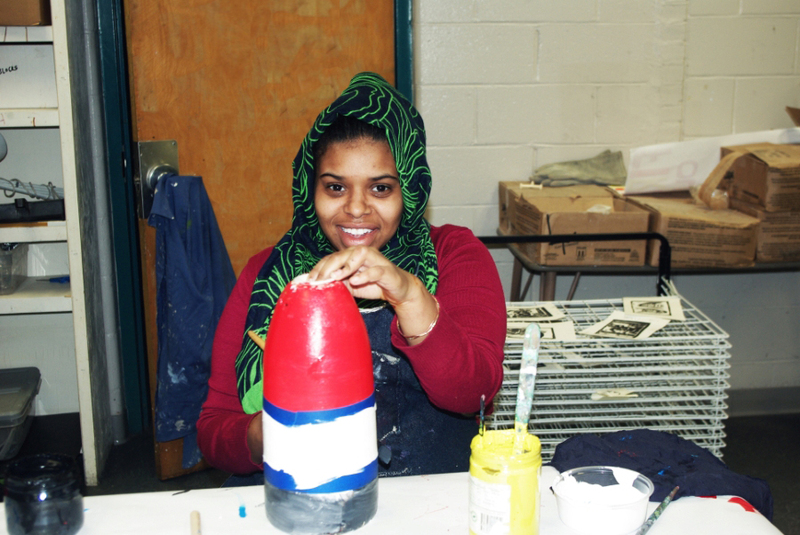 students from Lyman Moore Middle School and Casco Bay High School painted lobster buoys with the flags of their home countries alongside Natasha Mayers, a Whitefield resident who is the University of Southern Maine Art Department’s artist-in-residence this semester. The buoys were then hung on the Maine Historical Society’s fence in conjunction with the opening of the society’s “400 Years of New Mainers” exhibition, a celebration of the rich diversity of Portland. 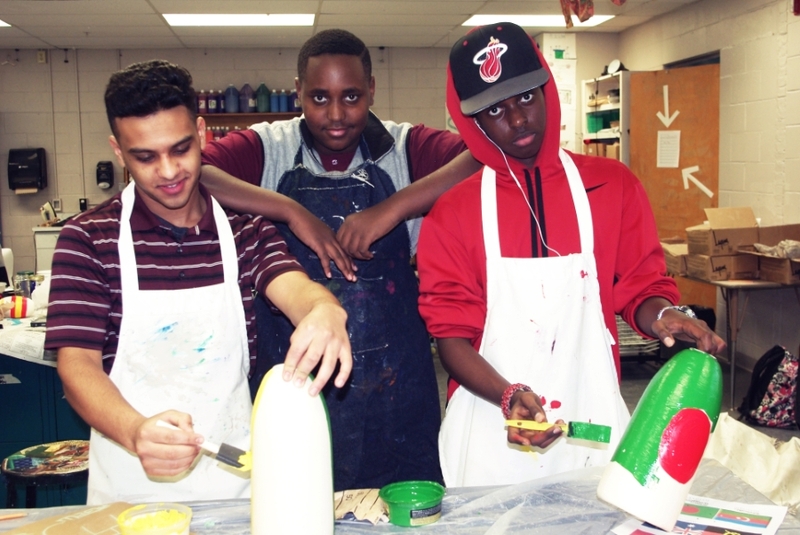 The first batch of buoys was painted by students in the Portland Public School’s Multilingual & Multicultural Center’s Make It Happen! Program. The program provides academic support, language acquisition, and a college readiness program for refugees and immigrants in grades 8-12. Make It Happen! AmeriCorps site coordinators and volunteer academic coaches help students take challenging classes, develop competitive college applications, and engage in leadership activities and civic opportunities. The program has centers in Portland’s three middle schools and three high schools. Approximately 30 Make It Happen! 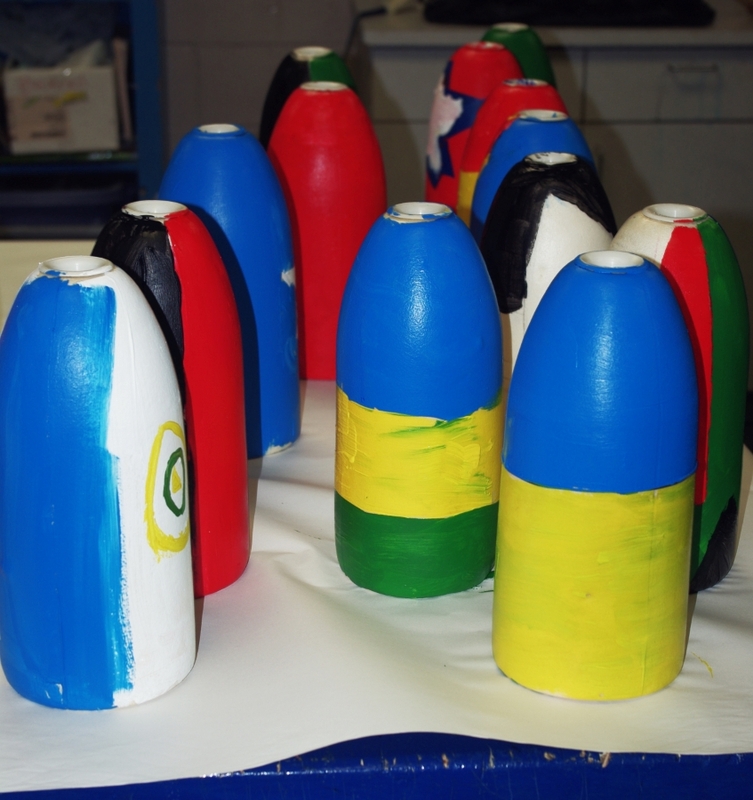 students worked hard to paint the buoys for the opening of the historical society exhibit. Plans are underway to install the buoys in other public spaces in Portland, including the Portland International Jetport, and to temporarily float them in the bay. Mayers hopes the buoy display will bring more awareness of the rich diversity being woven into Maine and help open hearts to the contributions and struggles of new neighbors. She is especially excited by the beauty, timeliness, and poignancy of the idea of floating in light of the dangerous sea-crossings being made by people fleeing conflict. The historical society’s “400 Years of New Mainers” exhibit runs through April 2. The exhibition highlights personal stories of immigration through photographer Jan Pieter van Voorst van Beest’s contemporary portraits of “New Mainers” and original works by street artist Pigeon displayed among items from MHS’s permanent collection. The show’s narrative includes the centuries-long history of immigration in Maine.